Follow the journey of Shammah and ancient Seth as author J.H. Ellis discusses her epic fantasy series, Seven Gates of the Kingdom. Shammah is skeptical about worshipping the gods. If he admires anything, it's his ability and willingness to learn as much as he can about law, culture, politics, and the stars. He could care less about the gods because they seem to care even less about him. But when Commander Eitan shares some of his experiences, Shammah senses the wisdom. And the warning. Life will soon change. Shammah and Peleg survive when their vessel capsizes. They escape their skirmish with the fierce Water People in their underwater kingdom. But when they wash up on the shores of Aikah's hometown, Shammah's life takes another turn when he meets Commander Eitan and his lieutenant, Asahel. Isn't it interesting how weighty moments in life happen at the most unexpected times? Shammah and Peleg leave Midvar and head home to Seth. A storm interrupts their journey and capsizes their vessel. The land ashore -- below the sea -- in the realm of The Water People. In Seth, Chazon receives a vision from Aleph about the trouble ensnaring Shammah and Peleg. The concept of exchanging temporary fame and success at whatever the cost isn't new. Nor is it new when people find a way to escape pain by abandoning their responsibilities or choosing short-cuts. In tonight's episode, we talk about how Aikah, Shammah -- and three new characters -- handle life's challenges. Will they make a pact with darkness or face the difficulties -- and the peace -- light can bring? Bloody promises in chapter 11 don't refer to sword fights or outright murders. That comes later. This chapter looks at the bloody promises made by the people connected to Shammah -- starting with his fiancee, adopted father and stepbrother -- to get what they want. They don't evaluate the cost of making oaths with the goddess Livnath. We have more to say about Aikah, king of Seth. Like men and women of power throughout history, Aikah resists changing his ways. False power deceives him. Like his enemies, the Mikana, darkness allures him. Aikah is the man everyone loves to hate. But what ignites fear in him? Learn about a mysterious visitation that shakes up the brutal king. This episode is Part I of chapter 10. Exiled from his family and the throne, Shammah now lives as a wanderer. He and his friend Peleg discover a place of happiness and leisure in Midvar. But is that really what Midvar means for Shammah? Who is Gila, the Queen of Seth? She's a woman who triumphs despite the cruel circumstances placed on her life. She's a picture of endurance and a reminder that one day comfort and joy will return. Follow along with the podcast series by reading more about Gila in "The Gate of Aleph" at amazon.com and barnesandnoble.com. J.H. Ellis reads excerpts from chapters six and seven about Shammah's return home and the painful confrontation with his father. We also learn about paying attention to the subtle cues of life that offer us direction. Follow along with the podcast series by reading more about Shammah's return in "The Gate of Aleph" at amazon.com and barnesandnoble.com. Learn how Shammah breaks the rules of the king and how the interests of his father's concubine don't align with the throne of Seth. Also listen for a hint about Shammah's real heritage. Follow along with the podcast series by reading more about the kingdom of Seth in "The Gate of Aleph" at amazon.com and barnesandnoble.com. The giant Mikana are longstanding enemies of ancient Seth and offspring of the star-born Zuzim. These horrifying creatures, inspired by the nephilim of Genesis 6, bear one thing of beauty. Follow along with the podcast series by reading more about the Mikana in "The Gate of Aleph" at amazon.com and barnesandnoble.com. In this inaugural podcast, author J.H. Ellis discusses the inspiration behind her epic fantasy series, Seven Gates of the Kingdom. 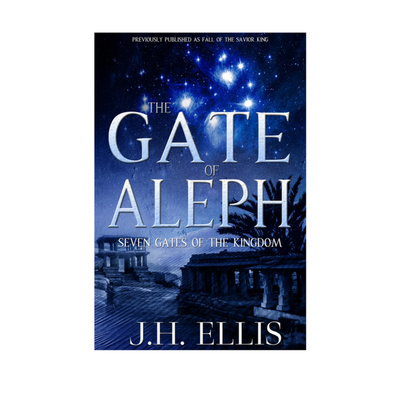 The first book in the series is The Gate of Aleph. In The Gate of Aleph, Shammah is the reluctant heir of the throne of Seth. He doesn't want to become like his brutal father. But when the dying king summons Shammah home, and when giant foes threaten the kingdom, assuming the throne is inevitable. Follow along with the podcast series by reading more about Shammah in The Gate of Aleph at amazon.com and barnesandnoble.com.